The British Government may resurrect the case against former Bayelsa State Governor, Diepreye Alamieyeseigha, who was granted presidential pardon by ex-president Goodluck Jonathan. According to reports, Britain has requested for the extradition of the former governor to London to answer an outstanding case in the UK on money laundering. The Chairman of the Presidential Advisory Committee on Corruption, Professor Itse Sagay, was quoted to have said that the President Buhari-led government is prepared to assent to the request of the British Government as the United Kingdom has every legal right to demand for the extradition of the former Bayelsa State Governor. “The UK is in principle correct to be making such a request based on the fact that the crime was committed on the British soil. However, when there is delay in trial as a result of time, there may be consideration on legal grounds so that the trial is not seen as oppressive,” he said. 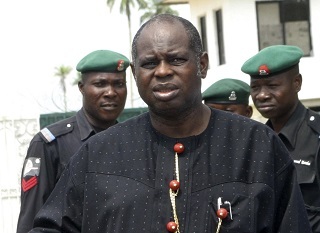 Alamieyeseigha, who was facing money laundering charges, had jumped bail in the UK and returned to Nigeria only to be pardoned by Jonathan despite substantiated allegations of corruption. He had continuously refused to answer summons for trial to continue in the UK.